When you place an order with Topline Foods, we do everything we can to ensure that your package arrives in excellent condition. Most of our products are vacuum wrapped and flash frozen in their natural juices to lock in the flavor. A few of our products, like the shrimp and chicken nuggets will be shipped frozen in a sealed bag. All of our items are shipped frozen, and hand-packed inside a Styrofoam cooler with ice. Our products are packed to arrive frozen or near-frozen upon delivery. 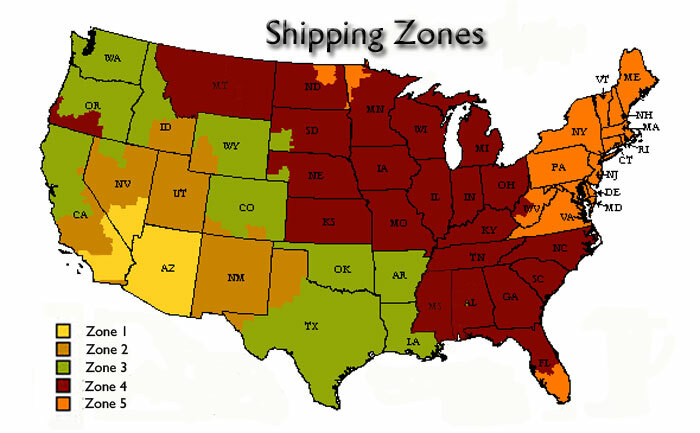 Depending on the day of the week you place your order, it will be shipped within 1-5 business days, and then the transit time is usually 24-48 hours. Once your order is processed, we will email you with our intended ship and delivery dates. We require that you reply to this email or call us to confirm these dates before we will ship your food. Our regular shipping days are Monday, Tuesday and Wednesday. However, due to special circumstances and national holidays, we will sometimes ship on Thursdays and/or change this schedule. Please contact our office at 623-444-7749 with any special shipping instructions. We are happy to honor these requests to the best of our ability. We ship your package via UPS and provide you with a tracking number to ensure accurate and timely delivery of your order. Please note: If you are using a P.O. Box for your billing address, please also provide a physical address in the “Shipping Address” area as UPS cannot deliver to a P.O. Box. We also provide personal home delivery in the greater Phoenix Metro area. How do I track the shipment of an order? When we ship your order, we send you an email with your tracking number. Typically, you can click on the tracking number in the email to see tracking information. If that doesn't work, go to UPS.com and enter your tracking number to track your package. You can also call our customer service department at 623-444-7749 and a representative will be happy to look up your tracking number, inform you of your package’s progress, and update your account information. I may not be home when UPS delivers. Will they leave the package? Yes. We keep a signature waiver on file with UPS so that they will always leave your package at your shipping address, even if someone is not home to sign for it. This ensures that UPS does not “hold” your perishable products. Our products are packed with enough ice to last an additional 8-12 hours of transit time over standard shipping times. Yes, orders over $49 can be picked up for free at our Phoenix location, and orders over $99 can be picked up free at either Phoenix or Chandler location. 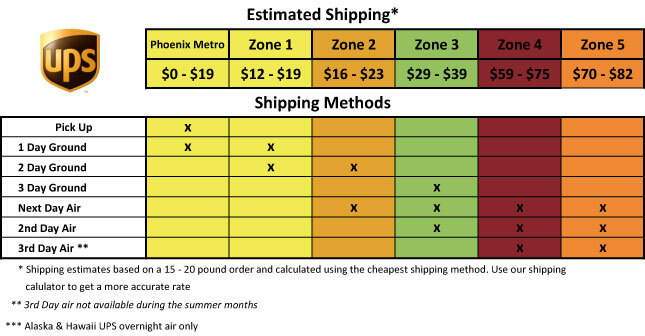 Orders under $49 that are picked up in Phoenix will be charged a $3.50 handling fee. Orders under $99 that are picked up in Chandler will be charged a $7 handling fee. To pick up at Topline Foods Phoenix offices: Effective 6/16/14 - We are located inside the Organic Living building at 8342 N 7th Street, Phoenix, AZ 85020 (click here for map). Pick up hours are Monday - Friday 9 - 6 and Saturday 10 - 5. To pick up your order, place your order online and select the "pickup at Topline Foods..." option at checkout. We will email you and let you know the soonest your order will be available. Orders placed Monday - Wednesday should be available for pick up that week. Orders placed Thursday through Sunday should be available for pick up beginning the following week. We ask that you reply to our "pick up email" with a 2 hour window when you will be picking up your order so we can have it ready for you. To pick up at True Health Centers Chandler office: They are located at 3220 S Gilbert Rd, Chandler, AZ 85286. Pick up hours are Monday, Wednesday, & Thursday 8 - 12 and 2 - 5, Tuesday's from 2:00 - 5:00, and Fri 8 - 12pm. Once you place your order online select the "pickup at True Health Centers..." option at checkout. We will email you to let you know when your items will be ready for pick up. Generally (but not always), orders placed by noon on Wednesday will be available for pick up that Thursday. Your items will be stored in a freezer at this location until you arrive to pick up. How do I thaw my items? It is best to thaw your items overnight in the refrigerator. It will take about 12-18 hours for the individually wrapped fillets to thaw and about 18-36 hours (depending on their thickness) for the other products to thaw prior to preparing. Do not remove the plastic wrap until ready to cook. You can also quick thaw the vacuum sealed items in a sink of cold water. This usually takes about 15-30 minutes. How long will my items last in the freezer? Most items will last from 6-12 months in your freezer, but for optimum taste and tenderness we recommend eating your items within six months. If my items arrive partially thawed, are they still good? Yes, as long as the products feel cool to the touch, the quality will not be diminished, and you can refrigerate or freeze them. However, chicken and seafood items should not be re-frozen. Items that are stored in the refrigerator should be eaten within a couple of days. If any product arrives warm to the touch, contact Customer Service immediately at 623-444-7749. When your steaks are vacuum sealed, the air is taken out of the package. This typically results in a deep, brown color in the steaks. Once the steak is thawed and exposed to air again, the reddish color typically returns. No, there is no minimum purchase. However, a $7 handling fee will be applied to all orders under $99. The more food you order, the easier it is to keep frozen in transit. Ordering less than $99 of food increases the chances your food will partially thaw in transit, so we can't guarantee your food will arrive completely frozen. One cubic foot of freezer space will hold approximately 22 to 28 lbs. of food.